A fair amount of Mac users running OS X Mavericks have discovered a peculiar slow speed issue when attempting to use various actions found in the File menu, including the Open, Save, and Export dialog boxes. 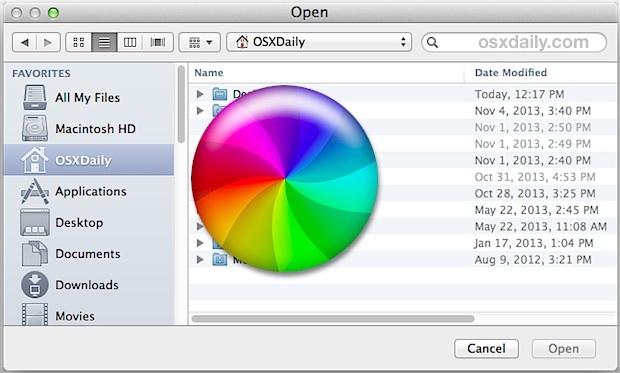 The problem manifests as an intensely slow lag when trying to use the Open or Save dialog windows, where the spinning beachball shows up, spins aimlessly for 3-15 seconds, followed by a lengthy slow delay before any files or folders populate the file action windows and allow a user to proceed. This behavior is almost certainly a bug and not all users of OS X Mavericks encounter the problem, thus if you have not experienced this issue there is no reason to make any changes. That said, plenty of commenters in our Mavericks Finder speed fix article also have the slow dialog box problem, and thankfully a workaround solution has been found on Apple Support Forums (thanks Droo!) that may work for some other users encountering the issue. Note this solution is a workaround, not a proper fix. The slow Open/Save issue seems to pertain to accessing network drives, and this workaround prevents network shares from automatically mounting. Accordingly, this will not be a valid option for users who map network drives for auto mounting, or for users who rely on automating network shares in any way. You must edit a system file using the command line, if you are not comfortable with Terminal then waiting for an official bug fix is probably a better idea. Now hit Control+O followed by return to save the file, then Control+X to exit out of the nano text editor and return back to the command line. Now you should be good to go, so exit out of Terminal and try to access any Open, Save, or Export dialog box window again. The slowness should be gone completely, and you’ll be back to speedy file interactions through the dialog windows as expected. This bug has been encountered and reported enough that we can assume a solution from Apple is likely to be due in a future OS X Mavericks update, be it 10.9.1 or otherwise. If you do use this automount workaround, remember to remove the # from the /net entry in auto_mount if and when an official bug fix arrives from Apple. Thanks! That seems to have fixed the issue for me. I’ve been wondering about that since upgrading and am glad to finally have the solution! Thank you…I think I had this bug before upgrading to Mavericks, however! Yep. Fixed it on 10.8.5 also. Good stuff! I found that this problem occurred for me more with column view than with list view. But I prefer column view in dialog boxes, so I’m looking forward to trying this fix. I performed a completely clean installation of Mavericks yesterday. Even on a brand new OS, it still happened. This workaround immediately fixed it. Thanks. I had several clients report this problem (also had it myself). This really resolved the problem (okay, it worked around it). Mine was already commented out? I also didn’t have the problem. Yay me. Thanks!!! You are the best site on MAC area! Thanks! This fixed slow Open/Save dialogs right away! Thanks for the fix. This has been driving me absolutely nuts for a month. I thought my brand new 2013 rMBP had a bad SSD in it. Fatelo solo se non vi interessa la condivisione delle cartelle e della connessione. Great this fix the problem. Miraculous! This worked for me, on my 5-year-old Mac Pro. Thank you so much for publishing it. This was so annoying, but this workaround has put an end to it. thanks! Thank you. It really works. You should get a medal. Did not work for me. Still the same old slow save dialogue…very frustrating. Be sure you update to OS X 10.9.2, it includes a bug fix that should resolve the slow and sluggish save window behaviors. Unfortunately, this didn’t work. I’ve applied this fix, as well as the fix of deleting com.apple.finder.plist and killing finder, as well as updating to 10.9.2. I still have the slow finder, which takes as long as 35 seconds to populate a directory. The strange thing I noticed, is that after deleting the plist file and then killing Finder, Finder reloads and recreates apparently the same plist file I had before, with all the same preferences. Problem is mainly (or only?) with Sibelius music notation software (7.1 and 7.5). When Sibelius is first launched after starting up the computer, the first save of a newly-created file completely freezes the computer for 2-3 minutes before Save dialog appears. Save dialog appears promptly for subsequent saves of the same file, or if you close that first file and create another new one. If you quit Sibelius and then re-launch it (without restarting the computer) and create a new file, freeze time for the initial Save is down to 7-8 seconds – better than 2-3 minutes, but still annoying. Thanks so much for this. It works fine for me right up until I hit Control+x, at which point it beeps as if it is an incorrect command. Any ideas? I too have had the same difficulty in exiting the nano text editor with a control X command. It’s a shame, because the sluggishness of saving in Finder has become a real PITA. Neither of the two suggestions has worked for me. You’ve probably already figured this out, but in case you haven’t, it asks you to save the modifications. For me, this meant simply pressing enter again. Then you can ctrl+x back into the main terminal window. OSX Daily, if at all possible, could you update the instructions in your article to include this step? Also had me stumped for a minute or two! Now can anyone figure out how to return Save As into a one click option in the File menu? WTF Apple! Quit fixing something to please Johnny Ive. Quit fixing stuff that ain’t broken! and emotional distress are the most commonly reported symptoms of sleep deprivation. It’s irritating the hell out of me, my computer is completely useless when I try to use finder. Easily taking 2 minutes showing the beach ball. Clicking on something, again 2 minutes the beach ball. Strange that Apple is not doing anything about this issue. Now have to work on my windows laptop to get anywhere because my 4500 dollar Mac Pro is to slow. Just applied this to OS X 10.9.4, and it seemed to resolve the finder lockups I have been experiencing. Thanks for that! It has been an ongoing issue since Mavericks came out. Same super slow finder and open save dialogs in OSX 10.10 Yosemite ?!!! – if you have LittleSnitch and an Antivirus like Eset, make sure LS is not blocking Eset proxy or you may not get connectivity. Same check with built in firewall. – If you have your own custom DNS settings, these may be flushed out when you restore the system so there are no DNS settings and you have to add them first. Reboot machine. – Freezing Open and Save dialogue could be something else – your permission perhaps, check those. – Check the Activity Monitor, it could be the “com.apple.appkit.xpc.openAndSavePanelService” that is freezing. Restarting this could solve the issue temporarily or there could be multiple instances running. This doesn’t resolve the issue completely, but at least it works in some cases without losing the whole document or shutting down the application or browser. Thank you thank you thank you. This seriously saved me seconds (minutes) of frustration. Nevet had this slowness when in Office. Am on vacation in Aruba and was seeing a lot of other systems available for sharing ( Bonjour systems in Sidebar). Problem would go away when not connected to wifi. Found a lot of other fixes that helped other issues, but the Commented out of ‘NET’ did the trick for my10.8.5. Thank you very much. You have save me a lot of time and relief my heartburn! thanks a lot. you saved me so much grief. I found out it was my Dropbox causing the slow save panel on Yosemite. I opened Dropbox Preferences, under General, unclicked the “Enable Finder Integration” and the beachball went away. Alan’s fix worked for me, and it means I don’t have to fiddle with OS X settings, which I like. I had a sense that it had something to do with something I had installed/configured, so when I read that comment I knew it would work for me. And it did. Alan, I hereby award you the “Pretty OK Guy” award. Thanks! Thanks Alan. This worked for me too. Excellent Alan — worked for me also. OMG… this was a bug back in … Mavericks? Well, still there apparently in 2017. I’ve been searching for a year for a fix for the sluggy hangs I’ve been suffering through! THANK YOU, whoever you are, THANK YOU!! !